The Big Blackfoot and Clark Fork Rivers twist westward between mountain ranges radiating from the spine of the continent. They wind through rich valleys amid vast public lands and family farms and ranches, often separated by no more than a strand of wire, and sometimes not even by that. Here, a responsible land ethic on both sides of the fence provides priceless benefits for all of us who live here—clean, cold water, habitat for diverse and abundant wildlife, and food on our tables. Just south of Drummond, Sue and Randy Peterson have provided a shining example of just such a land ethic. 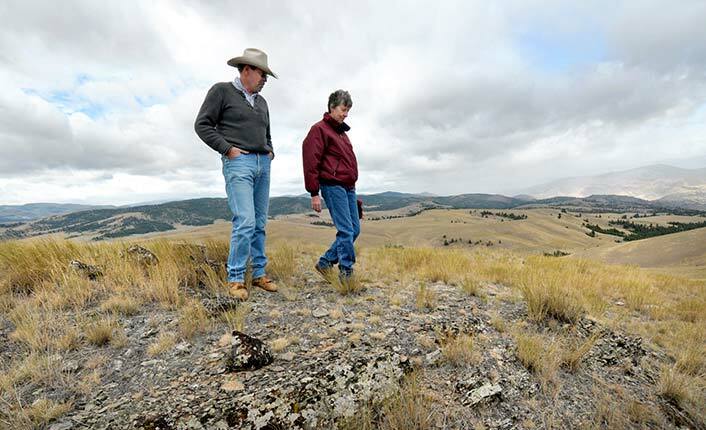 The 3,700-acre Peterson Angus Ranch in the foothills of the John Long Mountains offers some of the healthiest native short grass prairie in the Upper Clark Fork watershed. In the summer of 2010 the Petersons protected their ranch with a conservation easement held by Five Valleys Land Trust. Peterson Angus Ranch is a place where natural springs rise up through the grasses and rich soil to form Antelope Creek, home to native cutthroat trout, and life-giving cold, clean waters that feed the Clark Fork River. A hiking trail provides seasonal public access to the summit of Beacon Hill where visitors are able to look out over the ranch, the surrounding mountain ranges, and the confluence of Flint Creek and the Clark Fork, far below. The easement was made possible by a generous contribution from the Petersons, funding from the Natural Resource Conservation Service Farm and Ranchland Protection Program, and the Montana Natural Resource Damage Claim Program. From atop Beacon Hill one can look south along the John Long Mountains to the jagged peaks of the Anaconda Pintler Wilderness. To the north, the eyes meet the rugged ridges of the Garnet Range, where the line of sight follows a prominent ridge leading away to form the Chamberlain Mountain complex at the northernmost prow of the range. Due to the foresight of the Peterson family the ability to take in this view will be protected for generations to come.